The fantastic people at Celtx have treated me (and fellow Celtx community member Keith Loh) to a preview of the program’s next incarnation, version 0.9.8. I’ve been a fan of the software since at least February of last year (possibly longer) and have following its development ever since. 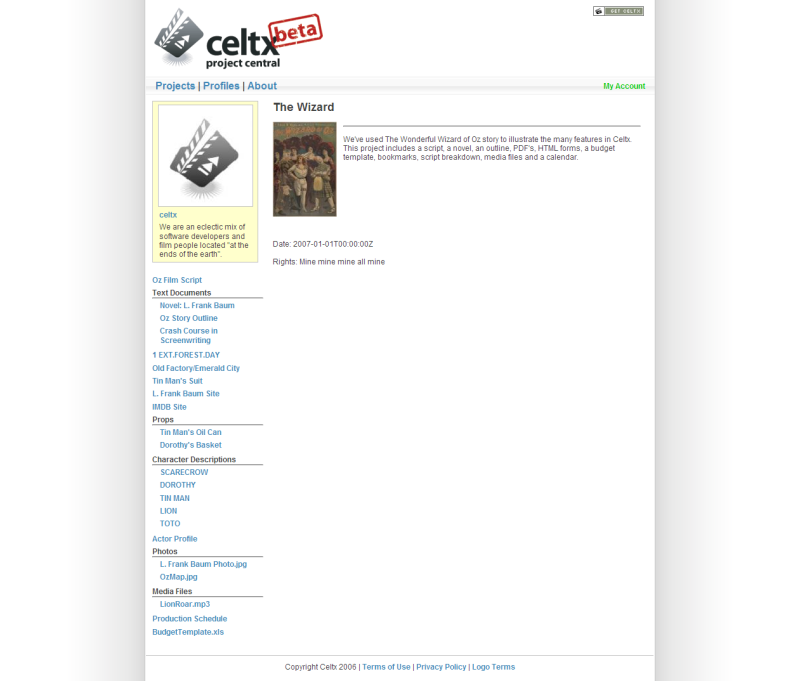 Celtx is a free/open source pre-production management software. It’s reach is far – within the program you can write your script (the most common use of the app), “break down” your script into lists of props, locations, etc., schedule your shoot, and share it all using Celtx’s free Project Central service. It is based on Firefox’s codebase (it uses XUL) and as such, there are builds available for Windows, Mac OS X, and Linux. It also makes use of Firefox/XUL’s localization ability and offers builds in 20 languages. The major changes in this version are server-side. Project Central (the collaboration server) has been given a total facelift and an all-around functionality update. The slick new interface offers support for a “project image” – for example a project logo, or just an image you think fits the project well. This’ll certainly help finding the project on the site – in the past when the interface was largely text based a “find text” utility was required. 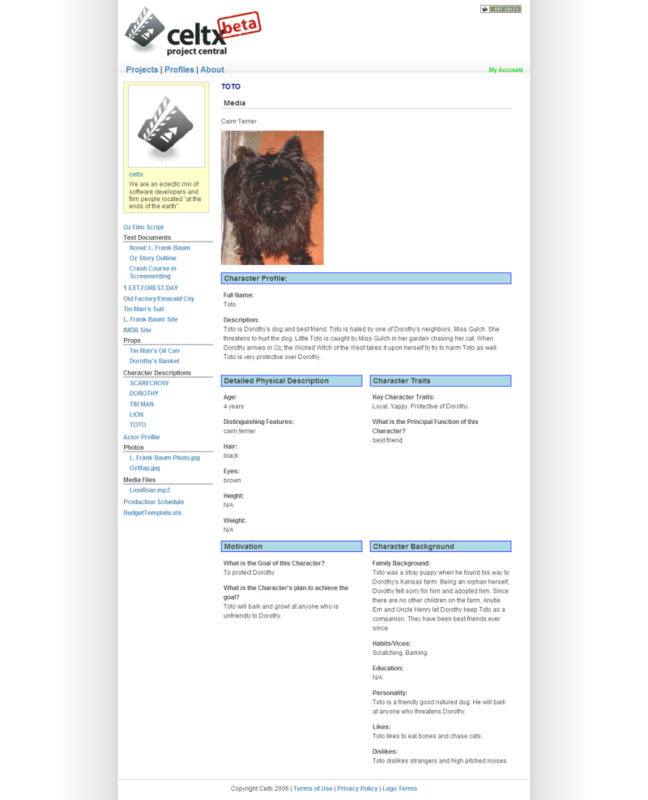 Writer profiles are now featured on the site, merging Celtx Central (the user database) with Project Central for the first time. 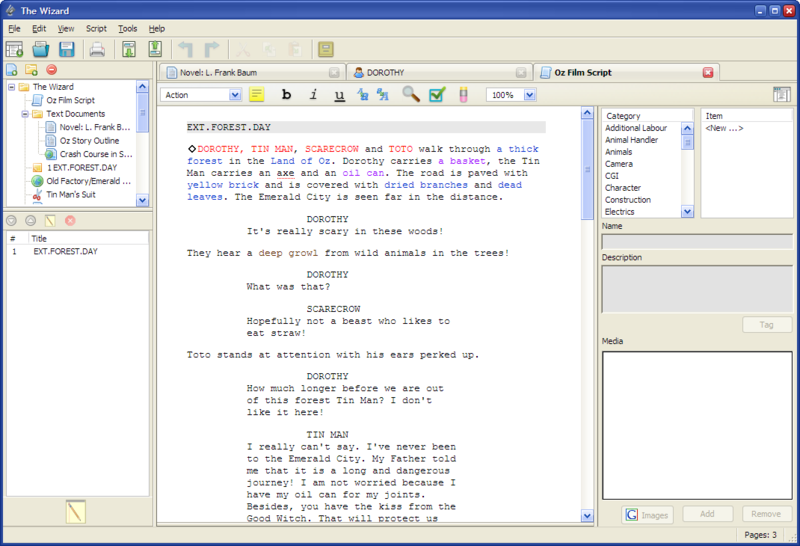 After browsing the main interface, you can open up your script. The general organization of the interface is similar to the old Project Central, but now much easier to navigate thanks to the new style. Along the left you’re presented with the writer mini-bio and the list of items included with the project, such as the script itself, character summaries, location reports, text documents, uploaded media, props, URLs, and in the future the project’s schedule. On the right you’re given the project image and a summary of the project. For example we can select a character summary and receive this. You can also put videos into your projects, from any video host (Revver, YouTube, etc.). I personally don’t see a use for this in pre-production, however I suppose it would at least mean another avenue of video display once production begins — the more people who see your work the better! My only big disappointment wiith the nw Project Central is the lack of a print stylesheet, or at least a Send to Printer option. Oftentimes I’ll try to remotely access and print my scripts through Project Central, however the lack of a print stylesheet complicates this — and I’ll have to copy/paste and reformat my script. Quite frustrating. Hopefully it’ll be implemented soon! Because of the extensive changes to the Project Central end of stuff, the client’s changes are mostly odds and ends. Most of the changes are there to help it interface better with the Project Central server, but there are a few that help smooth Celtx’s workflow. The first noticable difference (for me anyway) was the visually enhanced interface. No major movement of icons/buttons was made but the theme was slightly upgraded. Doesn’t help the process much, but it looks pretty! The second thing I noticed was the new options dialog. 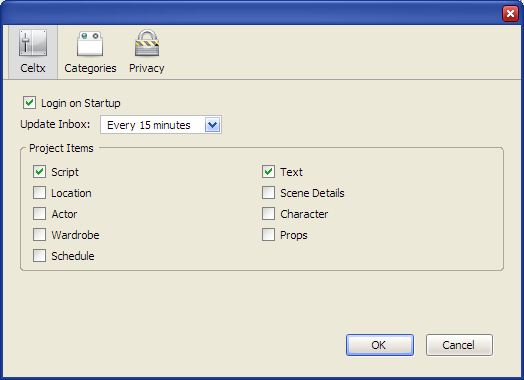 The new options window takes the same format as Firefox, helping to preserve continuity between the two programs. Notably added to this dialog is a Privacy tab, so users can choose to have their anonymous usage statistics sent to Celtx. Also added is the ability to change what categories display in the breakdown panel. Unfortunately there is not a way yet to add your own! Another notable difference is the major change to the Project Settings dialog. This is the dialog where the project image is defined, the project video, public v. private sharing settings, etc. You can also now define a project tagline. The project navigator is now linked directly with the breakdown panel. 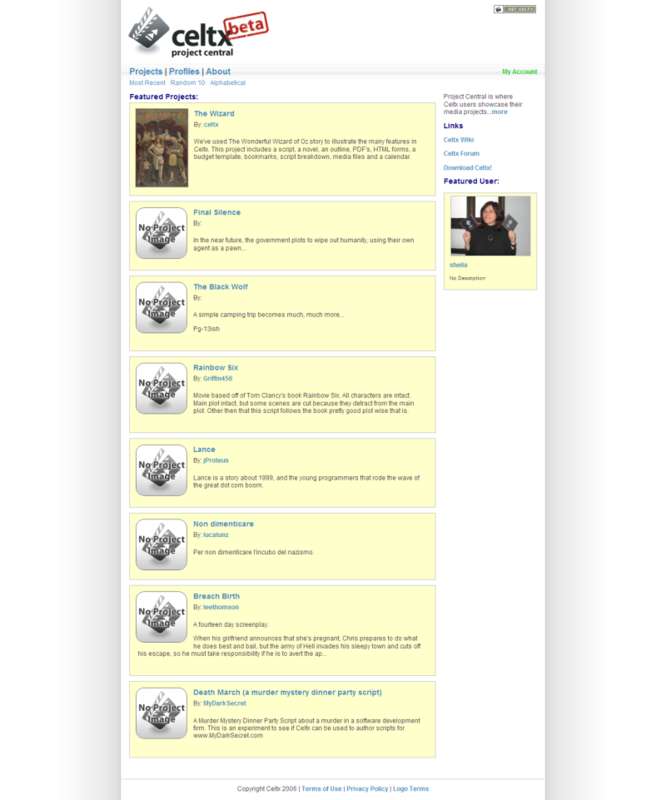 The link is merely with the creation of objects – items are added to one if you add it to the other. I’d love to see this go further, so (for example) if you have a character in the breakdown panel and that character in the project navigator, the description that’s displayed will be the same for both. Perhaps the line should be blurred so there is less of a difference between the two areas. They should become more one item that extend off of each other rather than two items that are sort of linked. I’m quite excited by this new release. It shows the Celtx is focusing on both sides of the solution; collaboration from the server and creation from the computer. It’s showing its polish well, and it is definitely worthy of the 0.9.8 release tag. There are improvements that can be made. I’d love to see some type of group/team management feature to help those in pre-production more easily determine who is supposed to get what information. If granular permissions were integrated with this, it’d make managing the project far easier. I’d also like to see password logins on the server side for those who set their projects to private. Some users might not want their project public, but would benefit from being able to access the script at Project Central. This will definitely be implemented when Celtx begins to sell the server software (which it’s widely suspected they’ll do) and I think it’ll be useful here too. It’d also be great to see Project Central and Celtx Central merged, and have them work as a single service. The line is slowly being blurred but I think that if the web service was a single site that worked from one user interface it’d ease transitions and make things easier to navigate. This appears to be on the list based on what I’ve seen of the new Project Central so far. All in all, excellent job Celtx team. I can’t wait until 1.0! Don’t feel like waiting for 0.9.8 to be released? Get version 0.9.7.2 right now. This entry was posted at 4:19 PM and filed under Freeware, Internet, Open Source, Pre-Production, Software, Technology, Writing.